I think most of us would all be in agreement when I say that one of the best parts of vacation should be the food! It's so fun to get to eat out and try different restaurants in a new-to-you location when you travel. 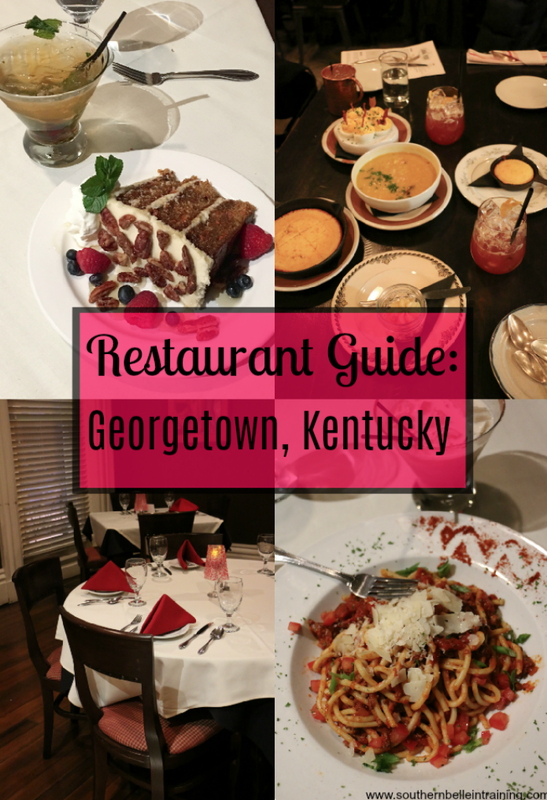 Today I'll be sharing a restaurant and food guide to Georgetown, which is the adorable town in Kentucky that I had the chance to visit for a press trip a few weeks ago! I'll be sharing a review of each restaurant that we ate at. Some I absolutely loved, some were okay... but I think that honest restaurant reviews for travel are always the best! Local Feed (214 S. Water Street): Our new friend Natalie from Georgetown Tourism treated Kylie and I to dinner here on the first night of our trip, and this was my favorite meal that I had while in Kentucky! 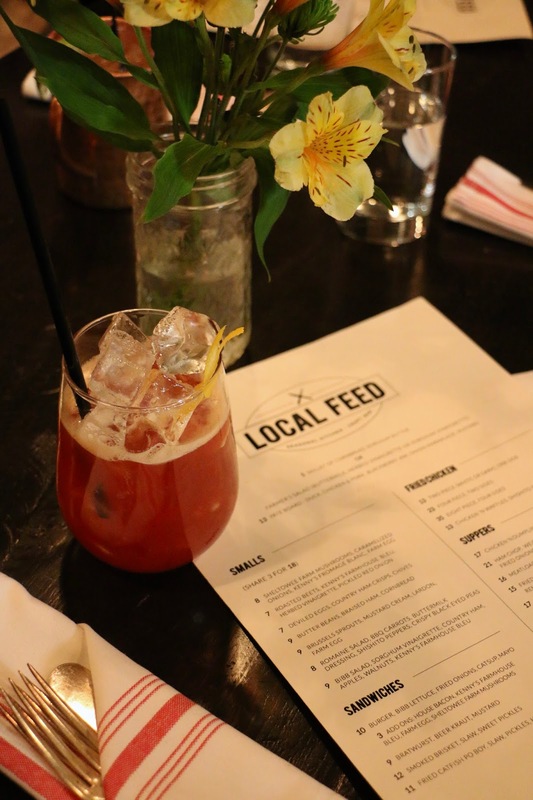 Local Feed describes itself as a seasonal kitchen and craft bar. They pride themselves on having a very "farm to table" based menu. Absolutely everything, from the cocktails to the main course, was just delicious! The atmosphere in the restaurant is very cozy and authentic as well. I can't say enough good things about Local Feed- I wish Kylie and I could've had the chance to eat there twice. If you're in the Georgetown area, you must go! I recommend trying: The rum punch (if you're 21+), and the chicken and waffles. Galvin's on Main (155 W Main Street): Disclaimer: I'm not usually a big fan of sports bar/pub food type restaurants. There is actually a local chain of pubs here in Vermont that my parents like to eat at when they come visit, but I really dislike the food. So I honestly didn't know what I'd think of Galvin's when Kylie and I headed there for lunch. I was so pleasantly surprised! 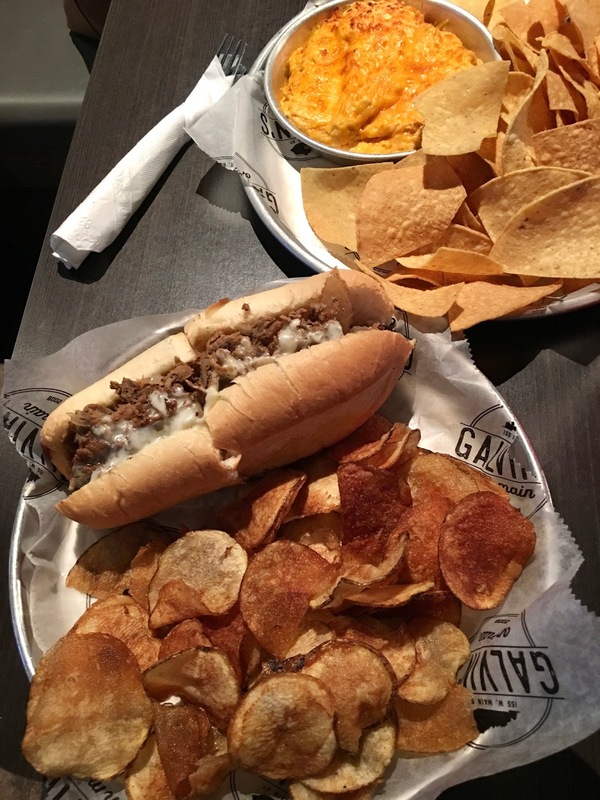 I am also not normally a sandwich person, but I had one of the best Philly Cheesesteaks that I've ever eaten at Galvin's. Their menu is very reasonably priced for lunch and dinner items, and honestly everything looked good! It was also fun to eat there while a UK basketball game was on and to see so many people in the restaurant cheering in their festive blue outfits. Rodney's on Broadway (222 N Broadway Street): Rodney's on Broadway is still new-ish to Georgetown, it opened in 2011. It offers a fine-dining experience and extensive beverage menu to compliment! Kylie and I were very excited for our dinner here, as this was going to be our biggest meal of the trip. We began our dinner with beverages off of Rodney's Christmas craft cocktail menu. The drink that I ordered was similar to a White Russian, but with Bailey's in it (my favorite liquor). 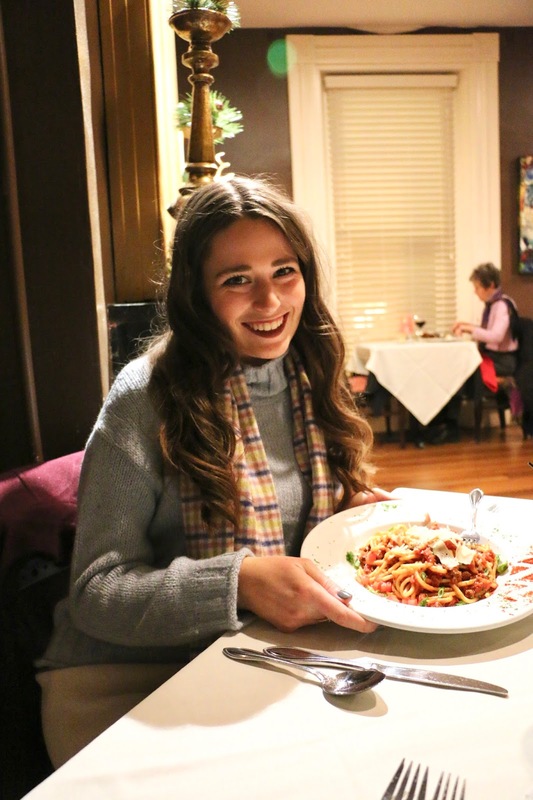 For dinner, I was in a pasta mood and ordered the Pasta Bolognese. It certainly wasn't bad, but it wasn't the best pasta either. I realize now that I probably should have splurged and ordered some sort of a meat dish, as those are Rodney's specialities. Oh well! I still really enjoyed my drink and the atmosphere at Rodney's on Broadway, and Kylie ordered a tasty carrot cake for dessert which I stole a bite of! Josie's (1973 Lexington Road): This is clearly the hotspot amongst Georgetown locals! Kylie and I went here for lunch after our visit to The Kentucky Horse Park, and we were blown away by how busy it was! We almost didn't find a spot to park in at the Josie's parking lot. 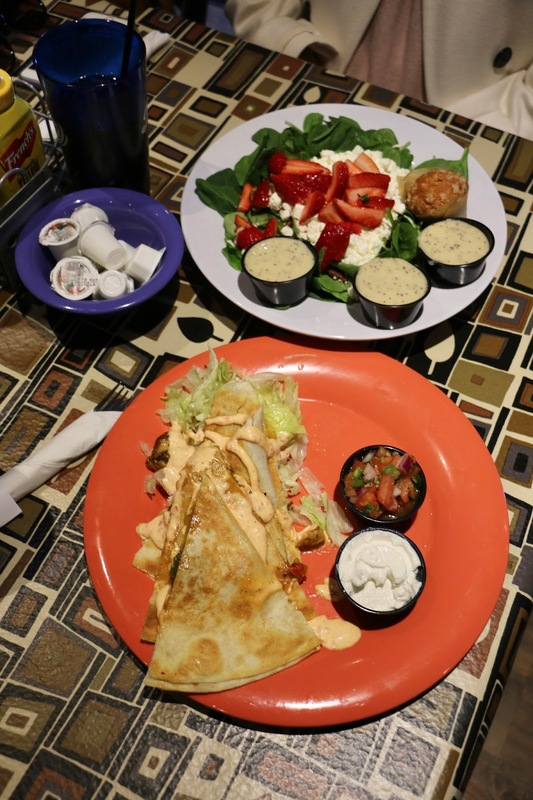 Josie's has a diner-style menu with popular breakfast and lunch favorites. Kylie ordered a salad, and I went with something on the menu called "Quesadilla of the Day." Unfortunately, my dish wasn't so great. I ended up sending it back to have it re-made, and it still wasn't too great the second time around. BUT- Kylie's salad looked absolutely delicious, and judging by how busy the place was, I think it's a great local restaurant, I just didn't luck out with what I ordered! Had we been in Georgetown longer, I would have loved to go back for breakfast. 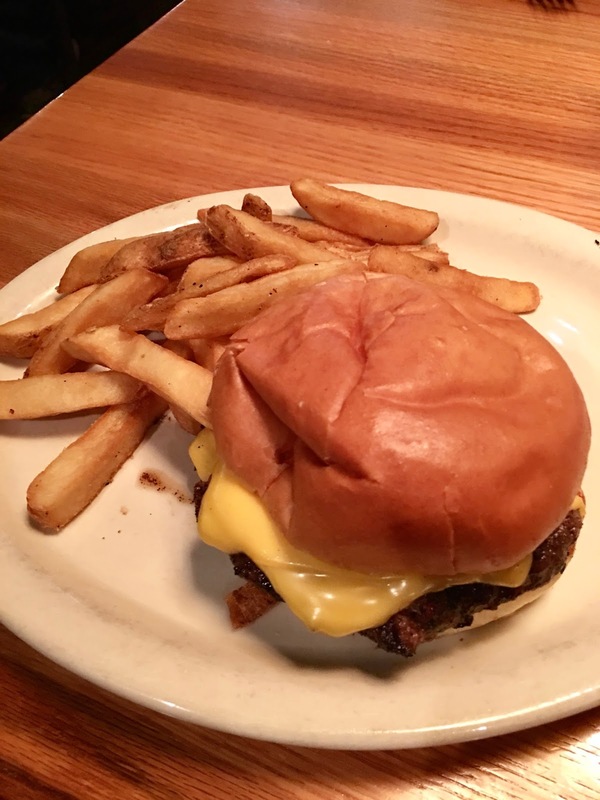 Cattleman's Roadhouse (240 Champion Way): Cattleman's is a regional chain of steakhouses in Kentucky, and I think the Georgetown location could be quite possibly the hottest spot in the town! It was located near our hotel, and every time Kylie and and I drove past it during the whole weekend, we were SHOCKED at how busy the parking lot was. I mean- this place was packed at lunch and dinner consistently! It's no surprise that this place is ranked #1 on Trip Advisor for best restaurants in Georgetown. So we were very excited for our Cattleman's experience. I was craving a burger when we went there for dinner, and it didn't disappoint! This is definitely a good choice of a restaurant to get a burger at. I'm sure that their steaks would be wonderfully tasty as well. Cattleman's Roadhouse is a casual, no-frills kind of steakhouse, but it's clear that they have very loyal customers and serve tried and true food! 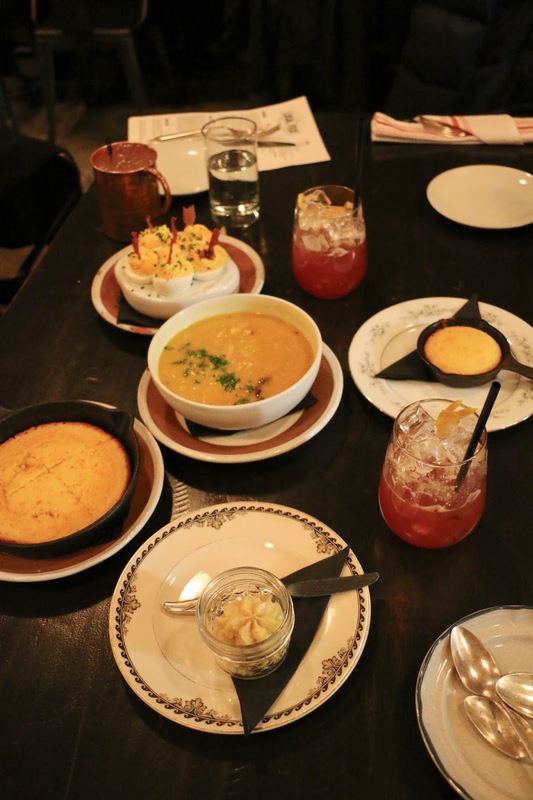 I hope that y'all enjoyed my restaurant and food guide to Georgetown! I'm looking forward to sharing my travel guide to the Georgetown area here on the blog after Christmas! Today's post was written in collaboration with Georgetown/Scott County Tourism. 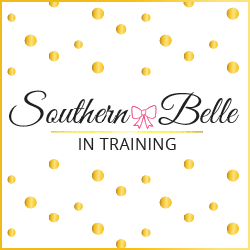 Thank you for supporting the organizations that support Southern Belle in Training! I agree - eating is the best part o going on vacation. I love trying out local spots and refuse to eat at any restaurant that I can have at home. I've never been to Kentucky, but it looks like the food is pretty delish! Okay that chicken and waffles looks AMAZING! I love finding great food spots. And waffle house is always a must, haha! I agree-nothing beats Waffle House haha. These places sound really good to eat at. 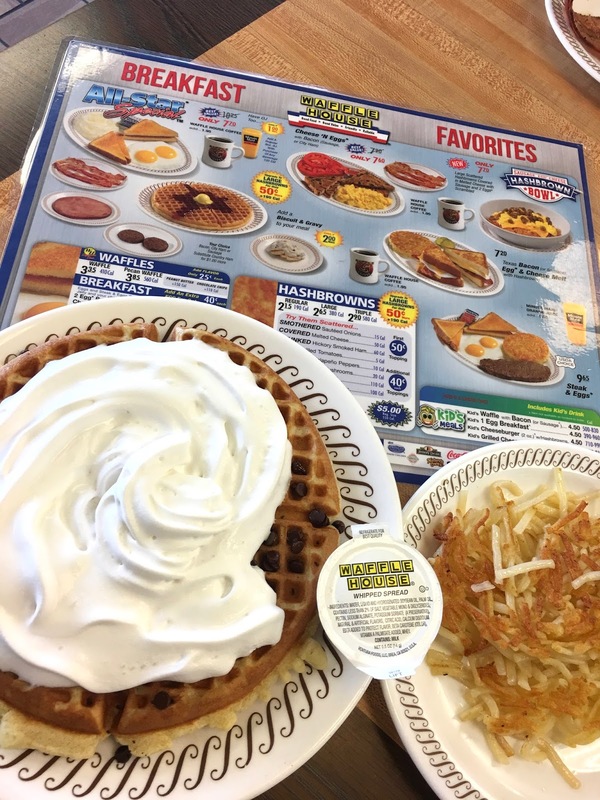 Waffle house is good if you're starving and craving some breakfast food. My husband and I literally plan vacations around food-types of food we want to try & restaurants that we want to visit...some of these places look SO good! Yum.. chicken and waffles! Looks like an amazing time in Kentucky! What a fun time in Kentucky! Loved all of the photos! These spots all sound so good! Yum! I've never been to Kentucky! I am so hungry just looking at all this food! Sorry your quesadilla didn't work out, but this looks ahhhmazing. I think I'm going to have to make a rum punch now. Holy whipped cream on that waffle, Batman!